This is the perfect time for Zambia's Amon Simutowe. The university student is currently enjoying his semester break in Yucatán, México and taking part in the Mérida International. Simutowe reported that nine of the top 20 seeds withdrew. Thus, he now stands as the 11th seed. 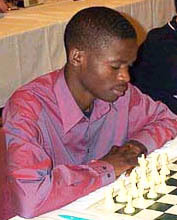 Simutowe crushed his first opponent, Mexico's José Alayola Montañez, by sacrificing two pieces and mating. This tournament will also feature Costa Rica's 15-year old GM-elect Alejandro Ramirez who gained notoriety when he drew GM Alexander Morozevich in the 2002 Olympiad. Other top players include Grandmasters: Thomas Luther (GER), Vadim Milov (SUI), Gilberto Hernández Guerrero (MEX) and Alonso Zapata (COL). After the 6th round, Simutowe reports, "There will be two-game knockout matches tomorrow for the top 12 after today's round plus the top four (Gelfand, Dreev, Nisipeanu, Filippov) The first round losers of the knockout will continue in the seventh round of the open section." 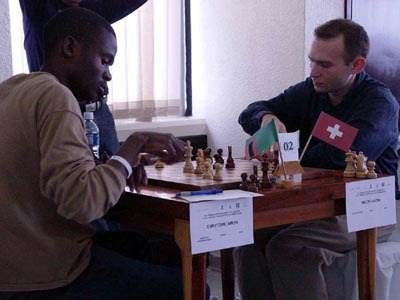 IM Amon Simutowe makes moves against Swiss GM Vadim Milov at the Mérida International. Milov won the encounter,but Simutowe got revenge in the knockout round. Photo from www.carlostorre.org/mx.